I mentioned earlier this month that I budget $150 to get Princess some winter clothes with the weather getting cold. On our drive back from Texas, we spent the night in Baton Rouge and ended up being across from a large mall on Black Friday evening. After a day in the car and some hours to kill, we decided to hit the mall. And lo and behold, Princess’ favorite clothing store Rue21 was having a sale and she hadn’t spent any of her clothes money. An hour later, she walked about with 1/2 new outfits for right at $80 – score! When I paid for the clothes I was informed we earned, 2 RueBucks. 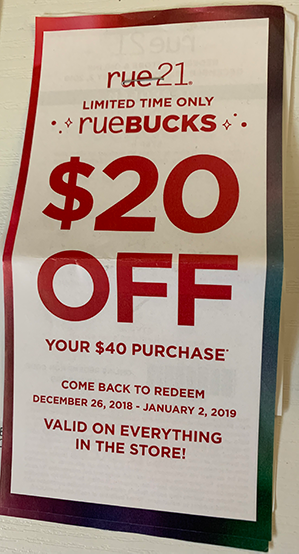 Which essentially means, if she shops again between December 26 and January 2, she can get $20 off her $40 purchase. I got to thinking, I could buy her a gift card with $40 of the remaining clothes money I previously budgeted and then add these two RueBucks into her stocking, essentially giving her $20 extra dollars to spend. Is that a bad Christmas idea? To give someone something that is essentially is free. I haven’t created a budget for Christmas presents. I know I should. I have begun picking up little stuff and it was all inside our trip budget so I haven’t used any extra money. 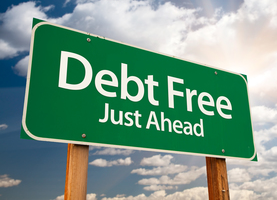 But I really am focused on paying off debt and getting into a better financial place. I’m having a hard time balancing my desire to provide a Christmas for my three eldest and being as frugal as I have been the last few months. Do you have a Christmas budget? How much do you spend on teenage children? I guess one of my challenges is that they don’t really “need” anything and their wants are pretty expensive…new computer, etc. So I have to find a middle ground I am comfortable with. And it’s not coming to me easily. I don’t think it’s wrong gifting her the the bucks. This. They give out those coupons to encourage impulse buys. If she buys something she was going to get anyway it’s a good deal. Otherwise it’s just spending money you didn’t plan on spending. Since I have already budgeted the money for her to get some new clothes and all my kids are VERY GOOD at only buying what they will wear, I trust that it would be used wisely. And since I know she enjoys shopping at this store, figured it would be a good Christmas present as well. I wouldn’t give her a Rue gift card–I’d just give her the $40. If she goes and finds stuff for $45, uses the $20 in Ruecash, she spends $25 of her cash and can spent the other $15 anywhere. If you give her a $40 in a Rue gift card, she has to find stuff that totals up to $60 exactly or she has leftover money on the gift card or has to contribute her own money to make it balance out. Or, I’d give her a home-made gift card for a shopping day with Mom where you’ll put in up to $40 plus the $20 free. Then you guys get to spend some girl time together and she gets the clothes she needs. I agree with the homemade gift card/shopping day with Mom. Maybe you could even use that idea as a present with each of the kids. Do some activity at a price you’re comfortable with, or an individual meal out, shopping for something you may have budgeted for anyway (like in this case), or maybe even, as you’ve done in the past, taking advantage of other discounts/rewards/shopper’s loyalty/etc. A special experience and memory for each child with a relatively low price tag. If Rue 21 is her favorite store then I don’t see the harm in giving her a gift card there. It’s sort of giving herself permission to splurge on her favorite thing which is a gift in itself. Any chance you’re able to find a deal on the gift card? Maybe through credit card rewards or one of the discount gift card sites? I have 4 adult children. I tend to focus most of my attention on stockings I try to budget around $100 per child. An example of a stocking for my daughter might look like this: $10 gift card chick-fil-a $15 gift card to paner a bread, 2 Starbucks bottled drinks, a bag of truffles(lindor), a pioneer woman cooks cookbook, a mulan t shirt, calligraphy kit, and, an olay bath set and a toothbrush. An example of a stocking for my youngest son looks like this $25 GameStop gift card, a pair of sweatpants, nightmare before Christmas DVD(he is not a reader so he gets DVDs.) A bag of sour warheads, a container of hot chocolate, Jurassic park legos set and a schick razor set and toothbrush. Hopefully this gives you some ideas. I am not sure what you are working with budgeted but if it were me I would set my budget to around $500 for stockings (4 kids including gymnast)and activities like making cookies and a Christmas feast. I don’t know how feasible this is though since you just made a huge debt payment and went on vacation. As far as large expensive gifts that is where those gift cards can come in. It allows you to chip in and acknowledge their want without blowing your entire budget. I’ve also been known to waive my kids portion of the data plan back when they were just starting out. 3 months at $40 a month was my way of allowing them to budget that money for something else. I would be careful doing that though on a variable budget that may not be cemented in stone.